Taipei, Taiwan – June 2014 - COMPRO Technology Inc., a leading cloud IP video surveillance solutions provider, today announced Compro TN900RW, The World First Cloud IP Camera that can control your home appliance. 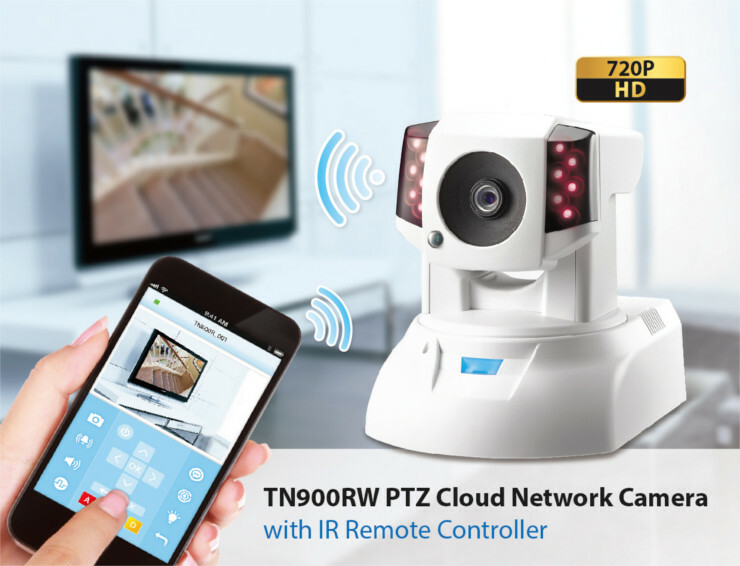 Designed with PTZ function and 720P HD resolution, TN900RW combines infrared and Wi-Fi technology, users can enjoy HD viewing on their mobile phone and control electrical devices via their smartphones anytime, anywhere. TN900RW has built-in IR remote learning mechanism, thru this patent pending design TN900RW can control your home appliances for easy and convenient life. For example: With TN900RW, user can control Pet food feeder to feed their loving pet on time, turning on air conditioner on a hot sunny day before reach home, turn on the household lights if late to be home. TV, BD/DVD, home theater, projector can also be control by TN900RW ! For the appliances that do not come with remote control, like fan or lamp, the design of Power IR Switch: PS-100 extent the remote control range of TN900RW. TN900RW built-in temperature sensor detect abnormal temperature condition with push notification and allow user monitor in time with preset temperature range in the C4home app. TN900RW is the good mate for home and ideal choice to know your parent, baby and pet when you are not with them. COMPRO officially launched TN900RW in Computex 2014. TN900RW has been instantly awarded and earned positive feedback from media and buyer around the world. COMPRO’s design concept has transcends the current definition of surveillance and home automation product.